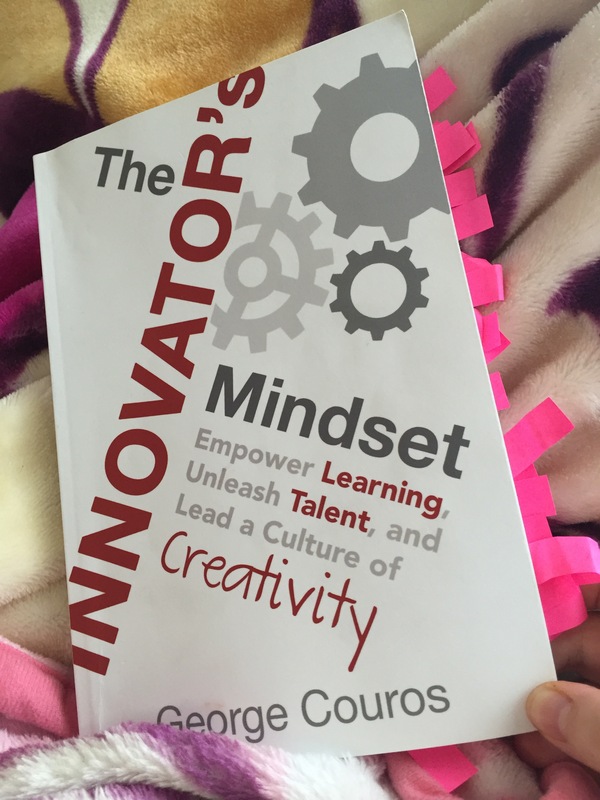 The Innovator’s Mindset was such an incredible and eye-opening read! While reading, I had the chance to participate in my first MOOC (massive open online course) and was therefore not only reading, but also reflecting with many other educators all over the world! Before reading the book I had been following George Couros on Twitter for a while, and loved his ideas, his way of thinking and what he had to share. Consequently, his book ended up in my summer reading pile. I had just finished reading Carol Dweck’s book Mindset, and was reflecting and working on adopting more of a growth mindset in areas where I felt maybe a bit more intimidated or hesitant to explore (such as blogging and innovative education). Here I am blogging about innovative education! Thank you Carol and George! Lucky for me, the summer got away on me and I didn’t get to George’s book until fall, which coincidentally and thankfully was also when the MOOC was starting! Although I mostly planned on lurking and reading what others in the MOOC had to say, the energy of the group was so encouraging and contagious, that I ended up being a fairly active participant. Participating in the MOOC encouraged me to reflect much more than I probably would have, had I been reading solo, and I’d love to read other books in this same way. Those who follow my blog or who know me well, know that to me, RELATIONSHIPS are everything! Through professional learning experiences related to attachment theory, I have come to believe that relationships are the foundation for all else, so it didn’t take much for George to convince me in Part II of the book, that relationships also play an important part in laying the groundwork for innovative education. I loved coming full circle like this and Chapter 4 (Relationships, Relationships, Relationships) was not surprisingly, my favourite chapter of the book! Another important and revealing chapter for me was chapter 2, titled The Innovator’s Mindset. I’ll admit that before reading the book, I wasn’t too sure how innovative education fit into my role as resource teacher and counsellor. Yikes! When thinking of innovative education, I would mostly think of makerspaces, green rooms, and 3D printers… I think you get my drift?! Thankfully my curiosity got the best of me, and led me to George’s book, and also the realization that innovative education IS my job all day long, and daily. I reflected on the characteristics of the innovator’s mindset in chapter 2 and realized that I already demonstrate or am working on many of these characteristics. To summarize, reading the book made me realize that innovative education is not so scary after all, but rather what I subconsciously am continually working at providing and modelling for my students. I am constantly asking myself how to make things new and better, which is really what innovative education is about. If like I did, you mostly associate innovative education with technology, you need to read George’s book! Read more of my thoughts and reflections on the book here, here, here, here and here! Previous Post Thank You Tribe!